Let’s start off with the scarf that’s in the photo above. I does look like a blanket that I’ve used in the photo background but it’s a lovely large scarf and it’s honestly the best £4 I spent for keeping me warm. It’s easy to wrap around me and I have actually used it as a blanket when it’s got a bit chilly recently. It was from Primark and they have a few designs in. I’ve gone back and bought a couple more as Christmas gifts. You all know that I love to bullet journal and I get through about 2 a year and this year my notebook ended in August so it meant I could start a new one in September. I use September as my yearly reset and do use it like I am still on a ‘back to school’ time frame. I’m not one for setting New Year resolutions but I do enjoy setting goals in September for the upcoming months and year. I do also love to get my Christmas planning done too. I had been eyeing up trying a Rhodia dotted journal for a while as I do prefer the dotted way of paper 😉 It’s really good, I’ve already bought my next one. I had heard that the Legend Foundation from W7 was a good dupe for the Double Wear foundation. People always raved about the latter and I saw this in B&M and picked it up to try. It’s now my go-to foundation and I did get it slightly lighter so that it would be good through the next few months… well aware that my tan is going to fade now. If you’ve been on instagram recently and not seen anyone posting an TK Maxx haul of DW Home Candles then… where are you looking?! I’ve seen so many pictures and stories and was impressed to see so many in store too. This Sandalwood and Tonka candle smells INCREDIBLE! I’ve already been out and bought a couple more. It smells like a sweet woody scent and it’s a great unisex scent and I love the design of the jar too. I used to absolutely use the Soap & Glory Supercat Eyeliner all the time and then I got a few other ones in beauty boxes but I went back to this one actually in the summer as I find it’s still got the best hold for me. I do have quite greasy eyelids – ewww! This is one of the reasons that my eyeshadows crease up so much on me. This eyeliner does not shift and it gives me a steady line. Can usually snag it on a Boots offer too! I got this in a Glossybox in August – the Kaleido Astrolight and I absolutely love a highlighter and this has a bronze sheen to it which I absolutely love. I also used it to put some colour on my lids and it did dry on matte which as I’ve mentioned before with my eyelids meant that it didn’t crease. It also kept it’s shine. I had been watching a few people on instagram talking about using the Maybelline Tattoo Brow. It then became quite common to see them carrying on their videos whilst they were using tattoo brow. So I thought I would give it a go and see what it was like. I’m now fully converted and would say it lasts about 3-4 days for me which is great as it’s stopped me from having to do them each morning. Just have to get used to looking a bit scary (as it does look dark) whilst waiting for it to work. Be great for Halloween – haha! Again these were another thing that I’d seen others use on instagram and they are in Poundland. I hadn’t seen them before, have looked every time that I have gone in. Then when I did the see the Collagen Hydrogel Eye Patches, I bought 5 packs! They are really good, they feel really tingly at first and are also cold. I’ve noticed that my undereyes definitely look brighter after using them and that this lasts for a few days too. Great for £1 a pack! Killing Eve – amazing TV, sometimes extremely violent but very much here to watch two fantastic female leads take centre stage. Discovery of Witches – I’m obsessed with this and I hate having to wait for each episode. The cinematography is so beautiful and I love the chemistry between Matthew and Diana. 9-1-1 – I knew I’d love this and I love how it deals with a different side than the other series of this type. It deals with taking the 9-1-1 call and then everything that happens after. There’s more but I feel that needs it’s own blog post. Here’s some music that I have been loving recently though. 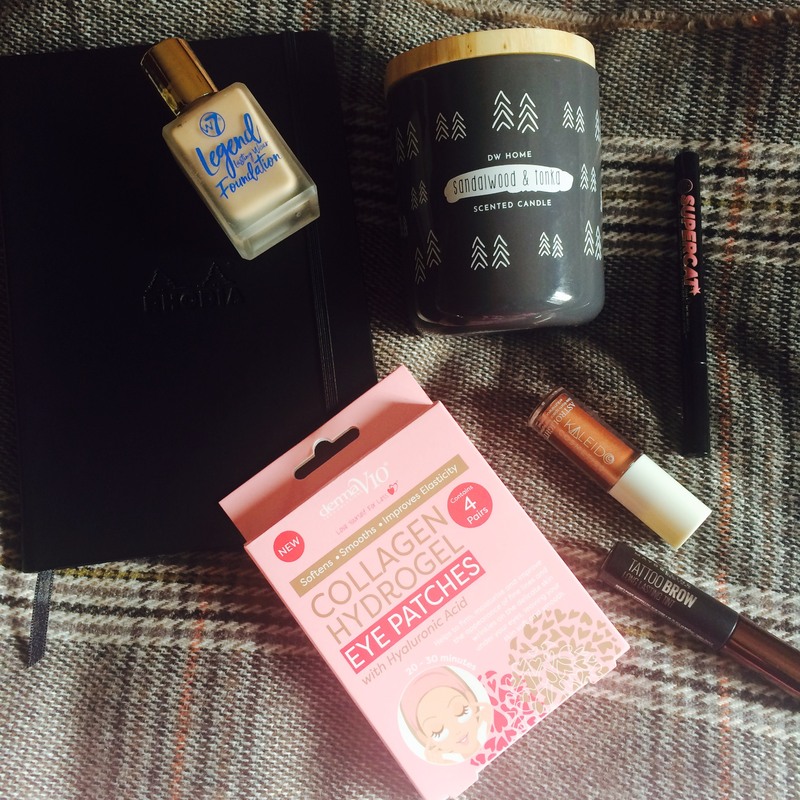 What is in your monthly favourites?